Click EVENTS for the 2019 tour schedule and more information. 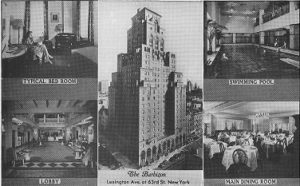 Below is the oldest catalog I have been able to find. This 1924 catalog is designed like a dance card that well-born women would use at formal dances to keep track of partners for each dance. Notice the card stock for the cover, the very modern style of the logo, and the binding. Rather than use a commercial binding, Mrs. Gibbs chose to have a white cord just like a dance card. This hinted to prospective students and their parents that the school was above the ordinary. 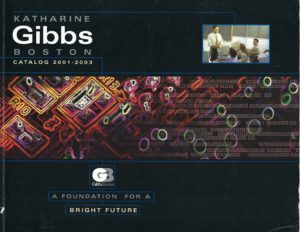 Below are 21st-century catalogs including the last Gibbs catalog in the world (right). The student body is again both male and female, the dress code is gone, computers are being used, and some students are in medical scrubs because the medical field is growing. 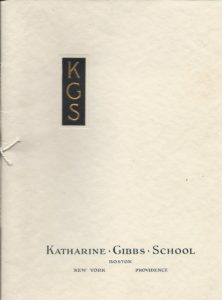 The 2001-2003 catalog says Katharine Gibbs without “school” while the 2009-2010 edition says Gibbs College. The catalogs are for only the Boston campus because by this time each site published its own material. Join the conversation. 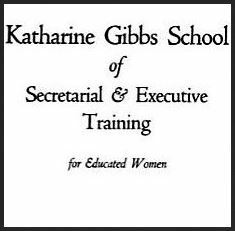 Learn about Gibbs history.Are you a Gibbs graduate, attendee, or interested in this important American history? Write to roseadoherty@aol.com to be added to the email list to learn about events, talks, tours, and more. Everyone keyboards now. Here is a real keyboard typewriter. 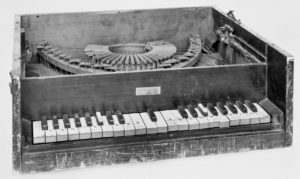 A typewriter patented in 1857 by a doctor from Newport has a keyboard that looks like a piano keyboard. It was called the “literary typewriter.” There are examples at the Newport Historical Society and at the Smithsonian. Check it out by clicking on Smithsonian. Katharine Gibbs: Beyond White Gloves is in the acknowledgements at the end of The Dollhouse by Fiona Davis. The chapters alternate between 1952 and 2016, and I was so happy to see some details from my book used. The true story of how two students would share one pair of gloves and get through morning inspection at the elevators is now in two books and will not be lost. STAND ABOVE THE CROWD! EXCELLENCE IN ALL YOU DO! These taglines from later marketing material sum up what Gibbs meant to so many.